Robbie and Bryan play a programme of bluegrass flavoured swing music along with material from that other style, swing flavoured bluegrass. Their repertoire encompasses bluegrass music from Bill Monroe and The Stanley Brothers to jazz standards from the 1940s. You will find Mr Sandman and Autumn Leaves alongside Pig in a Pen and The Kentucky Waltz. Robbie hails from Amsterdam and came to New Zealand when he was a teenager. He survived school, the days of prefects, caning and rugby, by playing lead guitar. Robbie got caught up in the folk revival movement when attending Auckland University and frequented and soon performed at Auckland's first folk venue at the Uptown Art Gallery. That opened exciting new musical horizons - blues, jug band music, early jazz and vaudeville, ethnic music and folk rock fusion, in which Robbie participated with passion, playing whatever instrument was required. He was the founder of the Auckland University Folk Music club, ran the first Folk concerts at the University Arts Festival and developed a reputation as an energetic and sympathetic side man and accompanist for a plethora of performers and artists, many of whom have since become legends of Kiwi Folk music. After finishing his studies Robbie got a job in Hamilton where he became a primary member of the Kontiki Folk Club and ran the first Hamilton Folk festival after the Banjo Picker's conventions, in a circus tent. While living in Hamilton, he and a few other members of the folk scene formed The 1953 Memorial Society Rock and Roll Band, playing to wrapt audiences throughout New Zealand and starring at the Ngaruawahia festival, New Zealand's first rock festival. .
Robbie went on to form the eclectic folk/rock/swing band Red Hot Peppers with his partner Marion Arts, touring New Zealand and Australia and recording four albums. After a couple of years in Oz, Robbie and Marion moved to Europe where they became active members of the folk and world music scene, including Greek, Cajun, Brazilian, Gypsy Jazz, Portuguese and French music. Then, a return to family in New Zealand, raise his own family and all the while playing music. Bryan got involved with music as a teenager, attending the National Banjo Pickers Convention and the subsequent Hamilton Folk Music Festivals. It was at these festivals where he first became aware of Robbie and was totally in awe of this man who could play more than 80 different instruments, all with apparent ease. At the time Bryan was developing his skills as a 5 string banjo player, performing around the folk clubs and festivals in New Zealand. In the early 80s Bryan embarked on his OE with the intention of taking in as many of the US Bluegrass Festivals as he could fit into a 3 month visit. Those three months expanded to 6 years of living in the Washington DC area, becoming friends with, and picking with, some of the finest bluegrass musicians in the world. On return to New Zealand, Bryan played with The Terraplanes for about 6 years, then had a 10 year hiatus. On returning to playing in 2003, he soon met some like minded pickers and went on to play with Wires and Wood and later, The Remarkables. It was at a small folk music gathering in Tauranga, 4 years ago, that Robbie and Bryan met for the first time. They quickly established a musical rapport and Robbie was soon a member of The Remarkables. All good things come to and end and Robbie departed The Remarkables, but that musical rapport was still there. 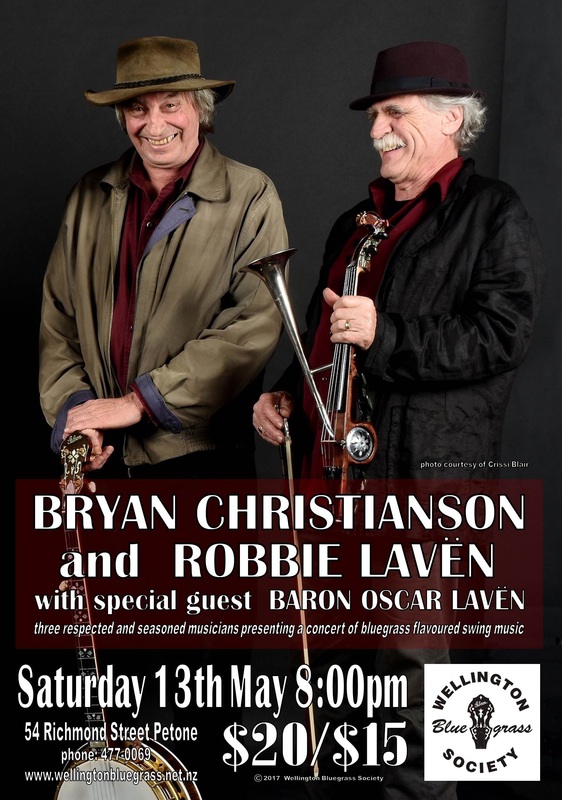 Robbie and Bryan continue playing together, presenting a programme of bluegrass flavoured swing music along with material from that other style, swing flavoured bluegrass.